Q: Are there children on Atys ? Why can’t we see them ? A: Yes, the homins do reproduce and have children. They are not visible in game because the 3D models don’t exist for the moment. Q: How long is a pregnancy on Atys ? A: The average gestation lasts three Atysian cycles, or thirty-six Atysian months. This duration corresponds to three quarters of a Jena year. Three Atysian cycles last about 54 days IRL. Q: Is there some profession specialized in supervision of pregnancy and delivery ? A: Yes. The pregnant hominas have access to these services unless they find themselves isolated, far from cities. Q: What about half-caste children ? Is there a rule ? A child from a Zoraï parent and a Matis one has nine chances out of ten to be a Matis versus one out of ten to be a Zoraï. A child from a Tryker parent and a Matis one has a six out of seven chance to be a Matis versus one out of seven to be a Tryker. A child from a Zoraï parent and a Fyros one has a six out of seven chance to be a Fyros versus one out of seven to be a Zoraï. A child from a Fyros parent and a Matis one has a four out of five chance to be a Matis versus one out of five to be a Fyros. A child from a Zoraï parent and a Tryker one has a four out of five chance to be a Tryker versus one out of five to be a Zoraï. A child from a Fyros parent and a Tryker one has a four out of five chance to be a Fyros versus one out of five to be a Tryker. Q: Are the children going to school ? A: Yes, in all fyros, matis and zoraï cities, children have a common education. Zoraï schools are under the authority of the Temple of Knowledge. Fyros schools are dependent on the Imperial Academy. Matis schools are managed by the Royal College. On the other hand, the Trykers don't have any formal school and children's education is provided by their family or possibly by a mentor. 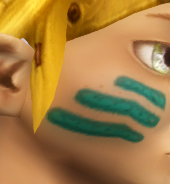 Q: Do Zoraï children have a mask ? A: No. They only gain their mask during their adoption ceremony which marks their transition to adulthood. This rite doesn’t occur at a fixed age. Some Zoraï children are ready earlier than others. Q: At what age is the onset of puberty ? A: The age at which a child goes through puberty and changes to become an adult varies from one individual to another. Q: Does menopause exist on Atys ? At what age does it happen ? A: Menopause (and andropause) exist but may occur more or less early varying from one individual to another. Q: What about the fertility cycle for hominas ? A: The fertility cycle doesn’t occur monthly but on a seasonal cycle. There are then 16 fertility cycles during a Jena’s year (as there is four seasons for each of the four atysian cycles of a Jena’s year).